Complex investigations are the real critical part of police work. 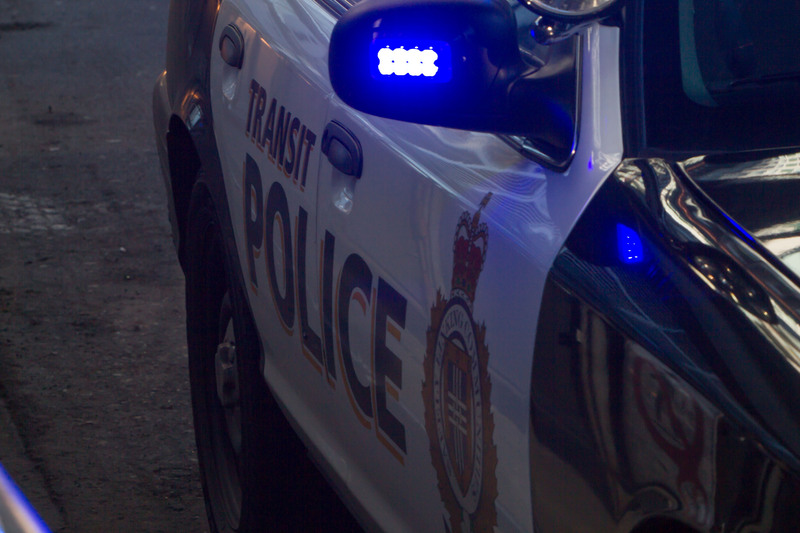 Transit Police has a special investigation team called the Crime Reduction Unit (CRU). Members of Transit Police who want to be a part of this team apply separately. The Crime Reduction Unit works closely with front line Transit Police and collaborates with other police departments within the region. 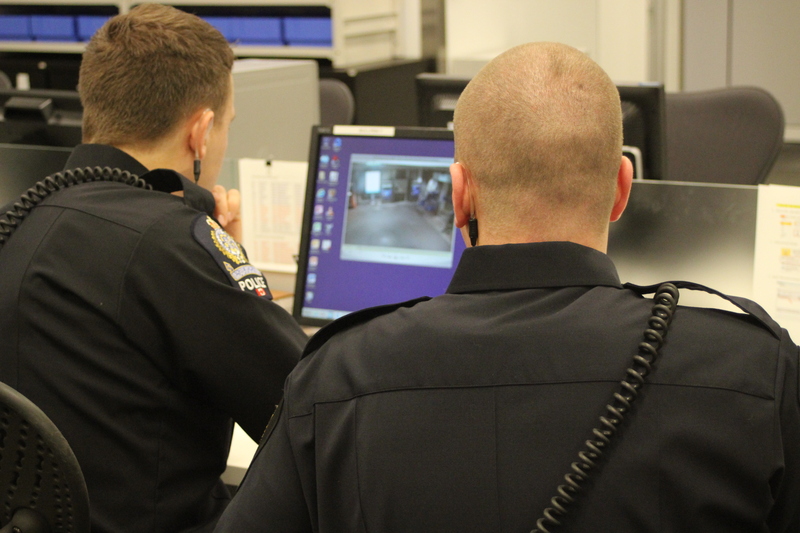 CRU officers are trained in tactical surveillance, intelligence gathering, offender management and forensic interviewing. This unit utilizes various investigative techniques conducted in both uniform and plain clothes. CRU is doing a great job helping keep the transit system as safe as possible for all riders! In fact, they are responsible for numerous apprehensions of criminals on and off the system in and around Metro Vancouver. Did you know that in 2014, alone Transit Police removed 967 wanted criminals and criminals breaching court imposed conditions from the system? Now, if you’re like me and you like to walk/cycle around your neighbourhood, I think you’d be hard pressed to find an area that has absolutely NO graffiti. It really is a major problem for cities all over the world! Houses, garages, businesses, cars and yes, even our transit system is constantly being defaced by graffiti. Transit Police Sgt. Wendy Hawthorne is internationally known for her expertise around the culture of graffiti and leading anti-graffiti strategies. She, along with a joint task force with police departments throughout the Lower Mainland and across BC, handle everything from major gang-related graffiti and hate crimes to prevention work within high schools. The strategy includes eradication, education, prevention and enforcement. Basically, it is about moving forward from the crime and in the instances of graffiti, having the perpetrators be accountable for their actions beyond the courts. One way to do this is with art programs that allow people to get out of the graffiti lifestyle and create art that doesn’t hurt or harm anyone or their property. Which personally I think it fantastic! With mentors, some of these people will truly benefit from it and be able to express themselves in a more positive and meaningful way. Next up in Transit Police Academy is recruiting (any takers?!) and IRAYL — the Inter-Regional At-Risk Youth Link. I’ll write all about it in my next installment in a week’s time. After my first evening in Transit Police Academy, I have to admit that I didn’t know what I didn’t know until I knew it! Transit Police was created in 2004 to be the thread that ties all the different jurisdictions in the region together. They are trained exactly as any other police department and have the power of arrest, have access and ability to share information with other police departments and RCMP and are accountable to many authorities both provincial and federal. We got a really great example of how Transit Police works in the Lower Mainland. An incident occurred in a Surrey SkyTrain station with the perpetrator then hopping on the train heading to New Westminster committing another crime on the system THEN getting on again and getting into some more trouble in Vancouver. Before Transit Police, these incidents caused by a single perpetrator included not one, not two but THREE police departments all with varying degrees of information based on the individual situations in their jurisdiction. Transit Police streamlines the process and they work closely with municipal police departments as their jurisdiction expands across the entire province! Teams of two try to stay near the system to jump on and off the train if needed to be at emergencies quickly and spend lots of time on and near major bus loops. But they are constantly moving. The breakdown of time is about 1/3 each for dealing with calls, administrative paperwork and patrolling the system. A full Transit Police department is 110 officers. Right now, they are at about 103. And yes, they’re hiring if you’re interested! There are the day and evening shifts with staffing 24/7. Officers are four days on and four days off. The split is about 10 units during the day and 12 (or more) in the peak afternoon and evening times. 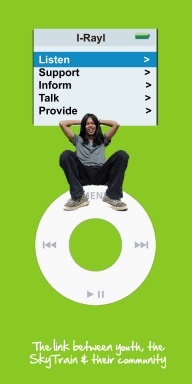 However, I think it’s their service delivery model that is particularly interesting. The new model in place now comes out of an independent report from Simon Fraser University that included surveys, workload analysis, time and motion and predictive analysis. Transit Police implemented their suggestions to create a hub system. 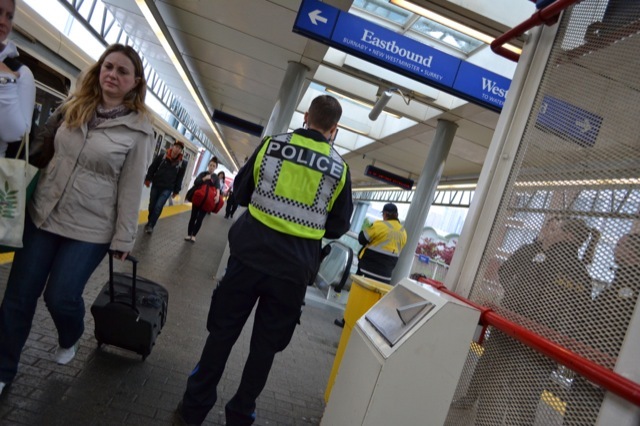 There are 6 major hubs along the SkyTrain system where Transit Police officers report to and from. These are: Bridgeport, Waterfront, Broadway/Commercial, Metrotown, Lougheed and Surrey Central. There are smaller hubs at many other stations as well. This creates a type of geographical “beat” for officers on the system with zones they patrol allowing them to get to know the neighbourhoods and people. This week we will be exploring intelligence led policing, communications with their Operations Communications Centre and the On Duty app. Also, we’ll be looking at the 87-77-77 text line. FYI! 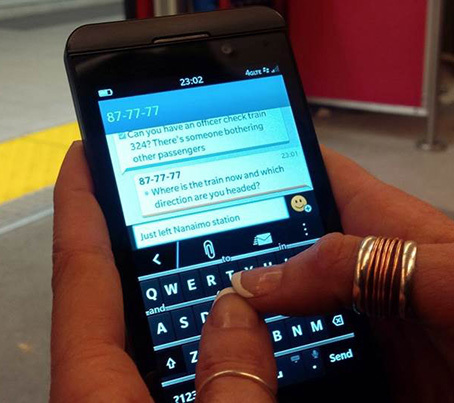 In one year, Transit Police received 31,000 texts with tips and concerns about situations on the system. I’m genuinely learning a lot and I’m happy to pass that on to you, Buzzer readers. Look out for my new post next week! All kidding and Simpsons quotes aside, I am always impressed by the level of dedication and training police officers have and Transit Police is no exception! They provide a vital service for our system and our region. Believe me, they do far more than just write fare infraction tickets. This is a full-fledged police service! Have you ever wanted to know more about the ins and outs of Transit Police? Me too! 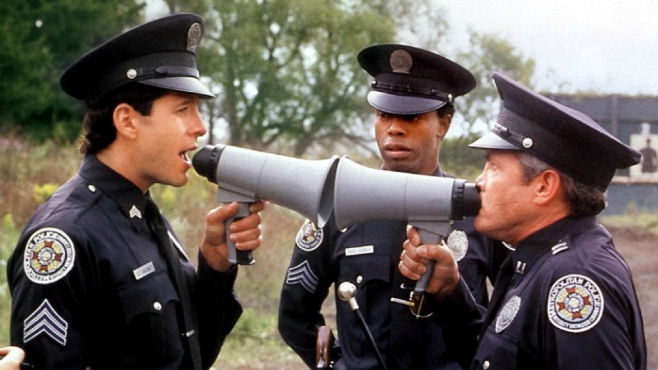 So, every Wednesday evening (starting tonight) until the end of June, I’ll be attending a TransLink initiative for employees called Transit Police Academy. I will be learning about how they police the system, tactical responses, investigation procedures and lots more. My goal in participating is to better understand what they do, why, how and pass that knowledge onto you, the rider (and reader). I will be posting about my experiences at Transit Police Academy each week so stay tuned for all my updates!